Old plywood boards cover the windows of an abandoned building. They are worn by weather and scratched and stencilled with letters and partly concealed words. 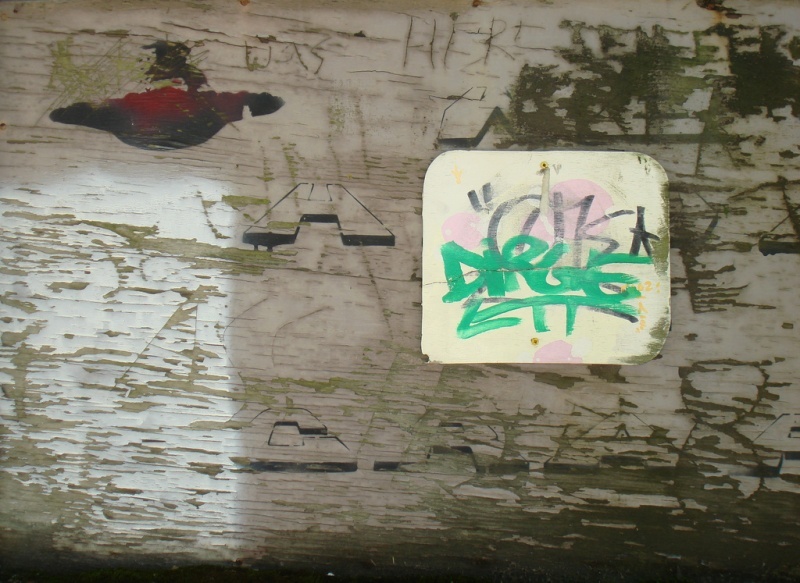 On a painted white square someone has written ‘Dirge‘ in green. Wiki tells us that a dirge is a somber song or lament expressing mourning or grief such as would be appropriate for performance at a funeral. The word is also commonly used to describe singing in an un-tuneful manner. Used here it is probably just the street name of the writer, however, the artist and poet in me sees it, in context, as a theme / title for the art work my eyes construct from the whole board. The board is a dirge, a lament for the passing of old buildings, their past inhabitants and time itself – it’s evocation is somber as the board is somber and its visual ‘singing’ is ‘un-tuneful’ in the sense that the board is out-of-tune with the aesthetics of conventional visual art work. The eponymous poem that follows is about fragmented and futile moments such as are reflected in this post and much of street art. It is about the life of an individual that shrivels amid the institutions and forces of contemporary life. It is about the loss of personal experience in the world of mass culture. Source: Kenneth Fearing: Selected Poems. Published by The Library of America, 2004. Love the whop, blooie, wham, biff and oof! Sometimes it feels like a cartoon strip – lots of action happening all around. the meeting of the inadvertent with the profound…it’s the human condition.